Hinges have a very ancient history. And though it is not known how many thousands of years hinges have served societies throughout antiquity, we do know one thing for sure: the world as we know it would not function without hinges. Hinges move doors, lids, gates, panels, shutters or other objects that must turn, swing, or pivot. From refrigerator doors to solar panels on GPS satellites, hinges allow for the movement of parts which in turn permit all types of devices and machinery to function. These all thrive and advance due to hinges that allow for the operation of machinery and equipment. The uses for hinges in the vehicle-manufacturing industry are virtually countless. And when it comes to uniquely-equipped vehicles, including specialized vans, fire-engines and ships for example, one will find corrosion-resistant, stainless-steel leaf hinges. Some leaf hinges are fabricated with an engineered, no-need-to-lubricate resin collar in the curled portion of the design which permits ultra-smooth turning of all types and sizes of doors and side panels. 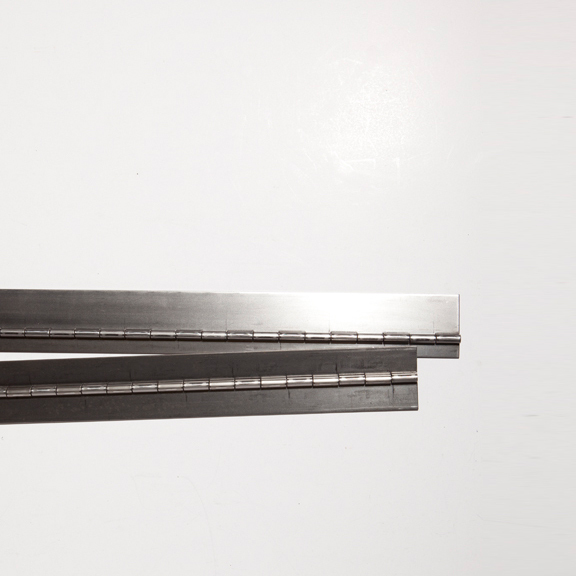 These hinges are built to last and are known for their durability to combat heavy-duty use. Then there are concealed torque hinges which retain vehicle doors or panels at preferred angles. Constant resistance throughout the entire range of motion makes it possible to easily position not only doors but lids and display monitors and hold them, securely, at any desired position. In fact, some torque hinges provide impressively-smooth operation throughout a 360-degree range of motion; and the torque value can be modified with an adjustment nut. Everything from surgical equipment to radiation doors to knee braces utilize highly-specialized hinges to ensure optimal operation. If we take a closer look at hinged knee braces, we should marvel at how various designs provide maximized stability for the ligaments of one’s knees. Whether it is an athlete desiring a hinged knee brace for day-to-day activities or an individual who must deal with ligament injuries or osteoarthritis, hinged knee-braces offer support, security and safety. Rigid-hinged knee braces provide optimal protection for the knee area, while soft-hinged braces offer a lesser-degree of support and utilize a knee sleeve or wrap, for compression. Customized, hinged knee braces are designed for an exact fit and ultimate comfort; and some designs provide multiple points of leverage to prevent one’s knee from entering the ‘at-risk’ zone. With advanced-hinge technology, the amount of time a knee might be in close proximity to the at-risk position is absolutely minimized. Highly-specialized knee-brace hinges ensure a reduction on the strain of the ACL (one of two ligaments in the center of the knee) allowing the weight placed on the ligament to be evenly distributed. Professional athletes around the world utilize customized, hinged knee-braces, including members of the US Ski Team, the San Diego Chargers and World Champion Big-Wave Surfers – maximum support is provided where one needs it the most – thanks to tech-advanced hinges! The military has, for about 40 years now, fantasized about mechanically-enhanced soldiers that would be able to carry heavy loads and traverse across terrain at high speeds – that fantasy is becoming a reality. The Pentagon’s Defense Advanced Research Projects Agency, known as DARPA, has already allocated more than $75 million to various contractors who are in charge of marrying artificial muscles and control systems into suits that are being feverishly tested and perfected on soldiers, firemen, and wheel-chair-bound individuals. What we have here are called ‘exoskeletons’; and as far as the military is concerned, these robotic devices permit beyond-human, ‘Iron Man’ capabilities. The unsung heroes of exoskeleton research and development are the variety of embedded hinges that allow for the movement of bionic arms, the bending of knees and the movement of ankle, wrist and neck components. Portable power systems with nano-scale motors are used to keep exoskeleton suits running for up to 24 hours; and powerful microprocessors turn data into immediate directions that coincide, in real-time, with the soldier’s movements. For example: a central processor recognizes when the suit’s user desires to bring his or her hands downward, upward or forward, for example; and it calculates what each artificial muscle in each of the joints needs to do to make the suit mirror the wearer’s actions. On-board sensors, hydraulic lines, valves, cylinder actuators, cables and an on-board computer all work in-concert with one another, to achieve maximized speed, agility, strength and endurance. A box on the suit’s back accommodates the computer and control systems. After it’s all said and done, a soldier wearing an exoskeleton could lift and carry an injured 180-pound comrade as if he or she were only a few pounds! Additionally, imagine an exoskeleton allowing a soldier to enjoy decreased fatigue, offer increased productivity, carry more weight and wield heavier armor and weapons while maintaining a lower metabolic rate. Coming in at about 65 pounds, exoskeletons actually support themselves thanks to hydraulic joints and electric motors – which utilize hinges, as well! Without hinges to allow for an exoskeleton’s fluid, seamless motions, these extraordinary machines would remain within the realm of mere fantasy, unrealized!